I'm late on this bandwagon with Real Techniques Core Collection. Previously I was in complete denial thinking that you don't need a million brushes and duplicates of every one. I was fine with my MAC 217, MAC 239, the brush in the Naked 2 Palette and my big Sephora one for everything else. This was until I started thinking that I needed a brush to apply my blush more precisely and for the price I decided to get a Real Techniques set. These brushes are incredible quality for the price, definitely comparable to the MAC and Sephora brushes that I already have. - The detailer brush I use for applying shadow to my lower lashes. No matter what eye look I go for I always apply the same crease colour to my lower lashes which ties the whole look together I think. - Buffing brush I use for powder or if I've gone a little over the top with my blush! 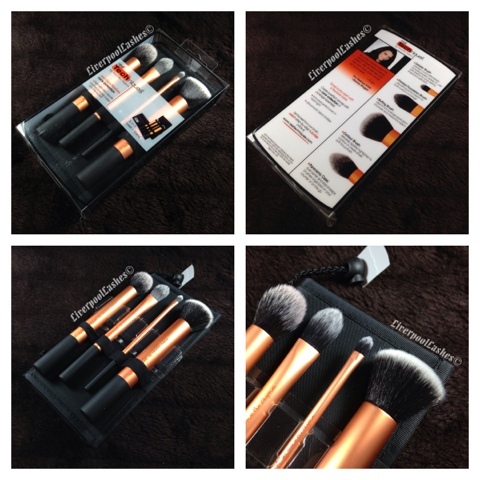 - The contour brush was the one I really bought the set for so I use for blush and bronzer. The bottom line is... They're definitely worth the hype. There is no need to run out and cough up £100+ for a load of fancy brushes from MAC or Nars anymore! I agree Real Techniques are just as good if not better than many branded brushes. I use the eyeshadow brush and foundation brush the most.